Brooklyn, NY - A vacant lot on a Borough Park corner may soon be the home to a synagogue of epic proportions. Congregation Heichal Hatefillah, led by Rabbi Binyomin Eisenberger, has filed plans for a 93,720 square foot synagogue to be located at 1772 52nd Street, which runs from the southeast corner of Old New Utrecht Avenue on 52nd Street until 18th Avenue. The six story building designed by prolific architect Karl Fischer, will have three floors located above ground, with the remaining three levels located below street level. Plans for the structure include offices, banquet and lecture halls and an on-site mikvah. Living quarters for Rabbi Eisenberger are also included in the plan and are estimated at 12,224 square feet by real estate website New York Yimby. 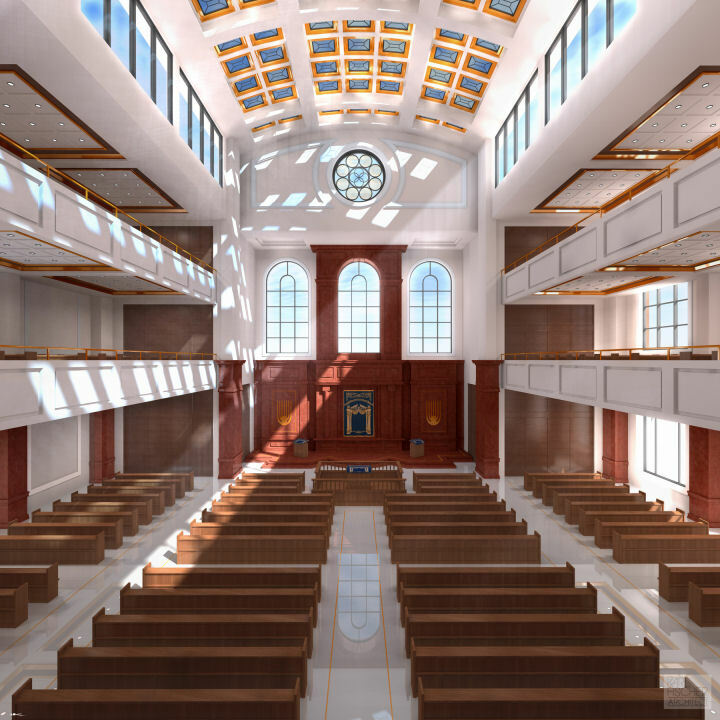 Pictures of the proposed synagogue show a large airy space with numerous windows, two levels of women’s balconies on each side of the building and four long rows of wood encased seating to hold the many expected congregants. According to the Karl Fischer website, the synagogue is expected to be completed in 2017. Fischer, who has offices in both New York and Montreal, has designed numerous buildings in Williamsburg as well as the 180,000 square foot Yeshiva Darchei Torah pre-school, elementary and junior high school campus in Far Rockaway. Will this be a Ma'ayan mikveh ? Or standard ? Someone finally wants to do something with that old carwash / gas station??!! My only other question is WHY THIS!?! “ Ashkenaz or Sefard ? You can ask them when you make a big donation. People are struggling to put food on their table for the chagim. People can't afford tuition, we need another edifice? We'll get one when Mosiach arrives. “ Someone finally wants to do something with that old carwash / gas station??!! I still have a car wash card with 9 out of 10 symbols punched out. 9/10ths of the way to a free car wash when they closed! Maybe I can use it towards a free mikveh visit? I thought non-modern shuls don't like the bima in the front but rather in the middle. with all due respect to Rabbi Eisenberger and his accomplishments to the klall what we need is NOT another shul in Boro Park! What we need is bold leadership to create another Jewish neighborhood because soon Boro park will be devoid of all young couples who can't afford to live in this community due to the astronomical cost of rent or purchase of a house! 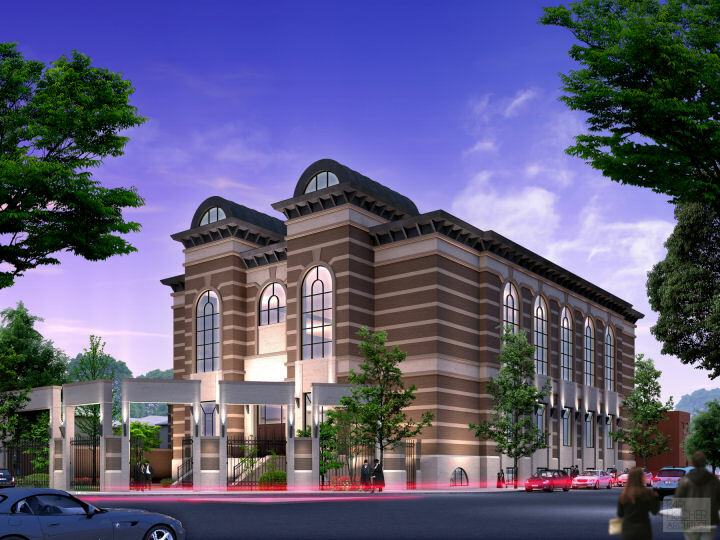 Why should tzedakah money go for another grandiose shul in Boro Park? We need investment in new opportunities for young frum families--there are over 300 shuls in Boro park! Will this be beneficial to residents who own cars? So many large shuls have extended "No Parking" zones in front of their shuls which do not have any time limits. If this is even a possibility, the residents of the neighborhood will launch a protest. There are simcha halls, a restaurant, and several apartment buildings. That means many cars, and more than the available parking. It is diffuclt enough without adding to that burden. Our dear politicians have all spoken about the parking disaster that exists throughout Boro Park. All have promised, but no one has done diddly squat to ease things. Residents have every right to know that coming home from work does not entail a half hour or longer just looking to park. I'm sure many details of this drawing will change. The podiums near the Aron Kodesh will also change. This is just the architects rendering. “ with all due respect to Rabbi Eisenberger and his accomplishments to the klall what we need is NOT another shul in Boro Park! What we need is bold leadership to create another Jewish neighborhood because soon Boro park will be devoid of all young couples who can't afford to live in this community due to the astronomical cost of rent or purchase of a house! I'm curious how accommodations for handicapped (eg; wheelchair access) will be incorporated into the design. Unless they have ground-level services or low-incline ramps, the only other option I can think of would be a so-called Shabbos elevator, which can be a challenge to design properly. The only valid comment so far. There's a ton of empty buildings, storefronts, homes and residential lots for sale in Kingston NY. One large shul (conservative) just sold out. No stress, no traffic, fresh air, very low to no crime, jobs available, Thruway Exit 19. The Catskills! Also a mensch Chabad Rabbi in town. For others there is a vibrant leftish-Jewish community in Woodstock (of course), Reformed shul in Kingston, and two shuls in New Paltz. Come visit- you won't want to go back to BP and look for a parking space for an hour and a half. I agree with your comment. Turn the property into affordable condos and there is still room for a shul / etc - instead of income from a simcha hall - generate income from the condos/apartments. People there need an affordable place to live. Even modern shuls should not have the bima in the front. The extreme low quality of life there is the reason we have waves of Brooklynites invading Monsey. PEOPLE are getting sick and tired of the wild driving and honking culture they are bringing along with them. We would much prefer if they would stay put. No need to worry. I predict in about 15 -20 years, the Chinese who are already up to Ft Halmiton Paky in the lower 50's and in the mid 50's up to 13th ave. will be living throughout boro park. Muslims are also moving in towards Boro park and are the majority on many blocks east of Mcdonald Ave.
With all due respect to his holiness Rabbi Eisenberger why 12,000 S.F. ??? Why not another shul? perhaps the old shul is to small to accommodate his crowed? Where should his congregates daven? And you're right we need bold leadership to create another Jewish neighborhood! however why is it Rabbi Eisenberger responsibility to create a new neighborhood? how about you move out from Boro Park to a less condensed area and make place for other people who decide to stay in Boro park? He is not forcing anyone to donate money for this project. i doubt they will build parking into the building. likely this will remove many spots like a previous commentor pointed out. with all these new yeshivas and shuls coming out you thing theyd go underground or somethng. it takes longer to find a spot here then it it does driving there.. I don't think the Muslims that live there could afford to pay those sky high rents. I guess when moshiach comes and the bais hamikdash is built the boro parkers will be kvetching about the high cost of korbanos and keilim ! "Living quarters for rav eisenberger"
“ With all due respect to his holiness Rabbi Eisenberger why 12,000 S.F. ?? ?